Allergic responses, characterized by the activation of mast cells and basophils, are driven by the cross-linking of IgE and release of proinflammatory mediators. A quantitative assessment of allergic responses can be achieved by using Evans Blue dye to monitor changes in vascular permeability after allergen challenge. Evans, H., Killoran, K. E., Mitre, E. Measuring Local Anaphylaxis in Mice. J. Vis. Exp. (92), e52005, doi:10.3791/52005 (2014). Allergic responses are the result of the activation of mast cells and basophils, and the subsequent release of vasoactive and proinflammatory mediators. Exposure to an allergen in a sensitized individual can result in clinical symptoms that vary from minor erythema to life threatening anaphylaxis. In the laboratory, various animal models have been developed to understand the mechanisms driving allergic responses. Herein, we describe a detailed method for measuring changes in vascular permeability to quantify localized allergic responses. The local anaphylaxis assay was first reported in the 1920s, and has been adapted from the technique published by Kojima et al. in 20071. In this assay, mice sensitized to OVA are challenged in the left ear with vehicle and in the right ear with OVA. This is followed by an intravenous injection of Evans Blue dye. Ten min after injecting Evans Blue, the animal is euthanized and the dye that has extravasated into the ears is extracted overnight in formamide. The absorbance of the extracted dye is then quantified with a spectrophotometer. This method reliably results in a visual and quantifiable manifestation of a local allergic response. Type I hypersensitivity is mediated by antigen-induced cross-linking of IgE on the surface of mast cells and basophils. This results in cellular degranulation and the release of vasoactive and proinflammatory mediators such as histamine, tryptase, and platelet-activating factor2. Following the release of preformed mediators during degranulation, mast cells synthesize and release prostaglandins and leukotrienes, which further increase vascular permeability3. The initial clinical response occurs rapidly and is referred to as an “immediate reaction”. In the skin, a wheal-and-flare response is readily visible within minutes of antigen challenge. Depending on the dose of the challenge, it is possible to observe a “late phase response” a few hr later. Late phase swelling is due to localized edema and leukocyte recruitment into the tissues2. Histamine, generally considered to be the major mediator taking part in immediate allergic responses, acts on histamine receptor 1 (HR1) expressed on vessels and histamine receptor 2 (HR2) expressed on smooth muscle. The combined effect increases blood flow and vascular permeability at the site of inflammation4. A variety of animal models of allergy have been developed in order to study the mechanisms involved in allergic inflammation, including models of allergic asthma, systemic anaphylaxis, and local anaphylaxis. Intravenous dye administration has been used to measure localized allergic responses in animal models for almost a century, with publications describing this technique dating back to the 1920s5. Rabbits and guinea pigs were the first animal models used to test immediate hypersensitivity reactions, and the most sensitive responses were generally found in the ear5,6. The assay was later validated for use in rats7 and mice8. Historically, a variety of experimental methods have been used, including injection of antigen prior to injection of dye, injection of dye prior to injection of antigen, and simultaneous injection of dye and antigen. Intravenous dye administration as a means for measuring allergic responses is a versatile assay as it can be used for measuring active, passive, and reverse passive reactions5,9. Numerous dyes have been utilized to assess allergic responses, including Trypan Blue, Pontamine Sky Blue, Evans Blue, Geigy Blue 536, and India Ink5,6,9. A solution of 0.5% Evans Blue is currently the standard dye used for measuring allergic responses in the skin. The anaphylactic response to challenge is transient; maximum intensity is reached within 10 - 15 min of dye injection, and no reaction is visible if dye is administered more than 30 min after challenge, regardless of the animal species used9. Quantification of dye extravasation was originally obtained by measuring wheal size as indicated by the blue dye7-9. Additionally, counts of degranulated mast cells can be quantified by excising skin tissue from the site of the reaction and staining with toluidine blue7. Mast cell degranulation is often used as a marker for cutaneous, IgE-mediated allergic responses, as mast cells are the main local cell population expressing the high affinity IgE receptor FcεRI. Spectrophotometric techniques for measuring dye extravasation into the tissue were developed for passive cutaneous anaphylaxis (PCA) in the rat10 and mouse11 in the 1990’s. The following local anaphylaxis assay protocol was adapted from Kojima et al.1, and utilizes chicken egg ovalbumin (OVA) as the antigen for eliciting allergic responses. However, antigens other than OVA may be used if desired. The assay then uses Evans Blue dye to monitor changes in vascular permeability that occur due to mast cell IgE cross-linking and histamine release. Prepare an OVA stock solution by diluting OVA in 1x PBS to a final concentration of 20 mg/ml. Freeze down aliquots in cryovials and store at -80 °C for future use. Bring one or more aliquots of 20 mg/ml OVA stock to room temperature. Dilute OVA in 1x PBS to a final concentration of 1 mg/ml in a 5 ml polystyrene round bottom tube with a cap. Vortex briefly to mix. While holding the polystyrene tube containing the 1 mg/ml OVA on a vortex set at medium speed, add an equal volume of thoroughly homogenized Imject Alum (40 mg/ml) dropwise while continuing to vortex the tube to produce a 1:1 ratio of Alum to immunogen. Place cap on tube and tape tube to vortex. Turn vortex on lowest setting and allow OVA to adsorb to Alum for 30 min. Do not allow a large amount of time to pass between preparing OVA/Alum and sensitizing mice. If sensitization cannot be completed directly after OVA/Alum preparation, store OVA/Alum at room temperature. Vortex for 1 min before using. Load a 1 ml insulin syringe with OVA/Alum mixture. Cap the syringe with 27 gauge needle. Inject 100 μl of OVA/Alum into the peritoneum of BALB/c mice for a dose per mouse of 50 μg of OVA and 2 mg of Alum. For a negative control, sensitize another group of mice to PBS. Prepare a 1:1 mixture of Alum and PBS in same manner as listed above, omitting OVA. Sensitize all mice (OVA and PBS control) once per week for 3 weeks for a total of 3 injections. After final injection, wait at least 2 weeks before performing the local anaphylaxis assay. Bring OVA stock solution to room temperature. In a 1.5 ml microcentrifuge tube, dilute 20 mg/ml OVA stock to a final concentration of 5 mg/ml with PBS (1:4 dilution of OVA in 1X PBS). Vortex briefly to mix. Anesthetize mice using RC2 Rodent Anesthesia System (or comparable vaporized delivery system). Fill reservoir with isoflurane, and turn on O2 airflow. Place mice in induction chamber and adjust isoflurane control dial to 5% to initiate anesthetization. Once mice are fully anesthetized, indicated by lack of mobility, adjust isoflurane control dial to 3% to maintain deep anesthetization. The purpose of anesthesia in this procedure is to immobilize the animal. The ear and tail vein injections do not cause significant pain or distress to the animal. NOTE: Isoflurane can have negative effects on the human reproductive system. Be sure to use in a well-ventilated room and attach a scavenging canister to the induction chamber to neutralize waste gas. If you are pregnant while using isoflurane, wear a carbon filter mask to minimize exposure. Load 10 μl of 5 mg/ml OVA into a 3/10 cc insulin syringe capped with a 31 G needle. Load another 3/10 cc insulin syringe with 10 μl of 1x PBS. Using a dissecting microscope, inject 10 μl of OVA into the right ear of an anesthetized mouse for a challenge dose of 50 μg of OVA. Other doses, such as 20 μg, are also acceptable. To stabilize the ear for injection, wrap scotch tape (sticky side up) around a 15 ml conical tube. Secure the dorsal side of the right ear to the tape. Insert the needle bevel side up between the two leaves of the ear. Slowly inject OVA into the center of the ear tissue, taking care not to hit any blood vessels. Using the same method described above, inject 10 μl of PBS into the left ear as a negative control. During this time, place the mouse in a restrainer and hold the tail under a heat lamp or in a warm water bath for 1 min to dilate the blood vessels. Using a 1 ml insulin syringe capped with a 27 G needle, slowly inject 200 μl of 0.5% Evans Blue dye into the tail vein of the mouse. Rapid injection may destroy the vessel structure before the entire 200 μl is administered. If this occurs, attempt to inject the remaining volume of dye into the vein on the opposite side of the tail. Euthanize the mouse and remove both ears using forceps and surgical scissors. Grab the edges of the ear with forceps, making sure that no pressure is applied to the injection site at the center of the ear. Remove as much ear tissue as possible by cutting close to, but not through, the ridge of cartilage present at the base of the ear. Small amounts of fur may be present on the excised ear; this will not affect the assay. Aliquot 700 μl of formamide into 1.5 ml microcentrifuge tubes. Prepare one tube per ear (two tubes per mouse). NOTE: Formamide is teratogenic, mutagenic, and an irritant. Wear gloves, eye protection, and face protection. Pregnant women should use caution when handling as formamide may be fetotoxic. Add ears to formamide, cap the tubes, and incubate overnight in a dry heat bath set to 63 °C. Ears may still appear slightly blue after incubation; however the majority of the dye will be extracted into the formamide. Add 300 μl of each sample, in duplicate, to a 96 well plate. Avoid transferring fur if it is present in the sample. Ensure that there are no bubbles present in the wells, as they will affect the absorbance reading. Add 300 μl of formamide, in duplicate, to the 96 well plate. These wells will be used as blanks. Use a spectrophotometer to measure absorbance at 620 nm. Subtract formamide wells from each sample reading. NOTE: All experiments were performed under protocols approved by the Uniformed Services University Institutional Animal Care and Use Committee. Animals that have undergone the assay successfully will have skin and eyes that appear blue. PBS sensitized animals should not react to either PBS or OVA challenge, therefore both ears should remain white (Figure 1A). In OVA sensitized animals, the ear receiving the PBS challenge (left) should be either completely white or lightly blue in a localized manner at the site of injection. 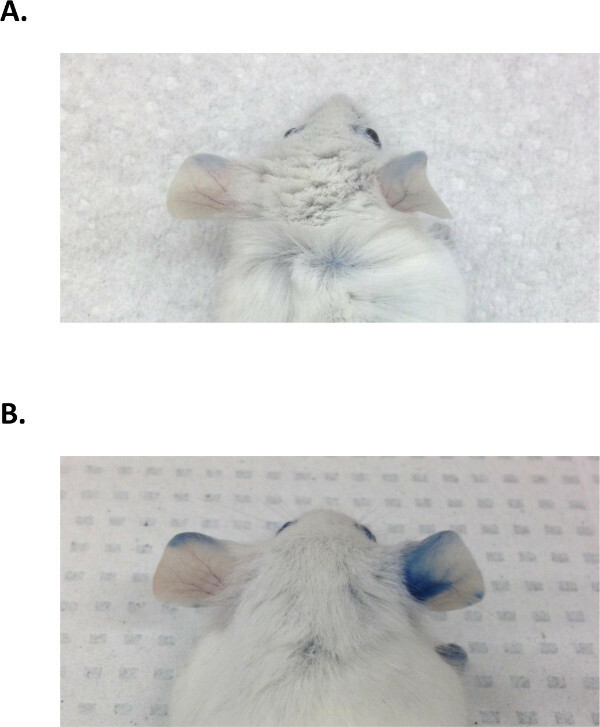 The ear receiving the OVA challenge (right) should become progressively darker blue during the 10 min after dye administration (Figure 1B). PBS sensitized animals will have negligible absorbance readings for both the PBS and OVA challenge (Figure 2A). For OVA sensitized animals, PBS injection generally results in a mean absorbance reading of 0.13 and a standard deviation of 0.04. Conversely, a 50 μg OVA challenge results in a mean absorbance reading of 0.58 and a standard deviation of 0.18 (Figure 2B). The amount of OVA used for challenge may be adjusted for individual experiments if necessary. For example, a 20 μg OVA challenge results in a mean absorbance of 0.30 and a standard deviation of 0.10 (Figure 2C), however a challenge less than 20 μg may not give reliable results. Changes in OVA concentration must be optimized and validated prior to use. Results may be graphically paired, with PBS absorbance compared to OVA absorbance. Alternatively, results may be plotted as a single value, with the PBS absorbance subtracted from the OVA absorbance for each individual animal. Figure 1: Ear pigmentation in PBS and OVA sensitized animals. (A). Ear pigmentation in PBS sensitized animals. The left ear (challenged with PBS) and the right ear (challenged with 50 μg OVA) show little to no dye extravasation. (B). Ear pigmentation in OVA sensitized animals. There is no allergic response in the left ear (challenged with PBS), as indicated by an absence of blue dye extravasation. The right ear (challenged with 50 μg OVA) shows a bright blue coloring indicative of increased vascular permeability, a direct result of cell activation in the ear tissue. Figure 2: Representative O.D. values for OVA sensitized animals. O.D. values derived from spectrophotometric measurements taken at 620 nm. (A). 50 μg OVA challenge in PBS sensitized animals. O.D. values for both PBS and OVA challenge are negligible. (B). 50 μg OVA challenge in OVA sensitized animals. PBS challenge results in O.D. values <0.2 and OVA challenge results in O.D. values >0.3. (C). 20 μg OVA challenge. PBS challenge results in O.D. values <0.2. The right ears have slightly reduced O.D. values due to a smaller challenge dose of OVA used. Numerous markers of allergic disease are used to assess the strength of allergic responses following allergen challenge, including changes in levels of circulating histamine, Th2 cytokine production, and cell recruitment into bronchoalveolar fluid in the setting of airway challenge. While monitoring changes in these parameters is important for studying allergic reactions, biological markers do not always correlate with clinical allergic disease. The local anaphylaxis assay described in this protocol provides reproducible measurement of localized vascular permeability as a correlate for localized allergic disease. By using blue dye extravasation, this protocol enables both visualization and relative quantification of a localized allergic reaction. In contrast to allergy assays that rely on clinical scoring, the primary outcome of this assay (blue dye extravasation as measured by spectrophotometric absorbance) is not easily subjected to observer bias. Another advantage is that animals are euthanized shortly after challenge, limiting any discomfort potentially caused by the allergen challenge and dye administration. The alternative use of a hand-held spectrophotometer described by Akiyama et al.10 allows for the continuous measurement of changes in vascular permeability. However, Evans Blue dye is toxic, and injection will ultimately lead to the animal needing to be euthanized. While this assay has a number of strengths, it does have the limitation of being somewhat technically challenging. Reliable results are dependent on consistent and successful ear and tail vein injections. If the entire challenge dose is not administered into the ear, if ear injection results in obvious puncture of a blood vessel, or if the Evans Blue intravenous injection is not complete, the animal should be excluded from analysis. In our laboratory, investigators have had to practice the intradermal ear injections for several weeks before developing proficiency. Additionally, it is important to run proper controls for the assay. Specifically, PBS injection should routinely be used as an internal control, as animals seem to respond slightly differently to damage caused by needle insertion. The PBS reading gives a baseline measure for changes in vascular permeability induced by the injection itself. In lieu of using intradermal ear injections, the assay may also be applied to the back skin of mice. Investigators may find this route to be less technically challenging, and, in addition, it allows for the testing of multiple antigens simultaneously. The local anaphylaxis assay is extremely versatile, as the challenge dose can be manipulated depending on the experiment. If it is necessary to look at changes in allergic responses, it may be beneficial to use a lower OVA challenge dose, such as 20 μg. This allows for increased sensitivity in monitoring changes in absorbance, as it will be less likely that the saturation point for cell activation will be reached. Additionally, this assay can be used to study passive cutaneous anaphylaxis (PCA). In this setting, antigen-specific IgE is injected into one ear and vehicle into the other. 24 hr later, the animal is given an intravenous challenge of antigen and Evans Blue dye. The PCA model can reduce the time it takes to complete the experiment, the number of animals used, and allow investigators to look at the specific effects of IgE cross-linking. Despite taking longer to perform, there are some advantages to using the active cutaneous anaphylaxis (ACA) model described in this paper. Sensitization through weekly exposure to antigen mimics the process by which individuals develop allergic disease, as sensitization is usually systemic and people generally have both allergen-specific IgE and IgG in circulation. While IgE cross-linking is the primary means of mast cell degranulation, mast cells also respond to IgG cross-linking. Therefore, the ACA model allows for researchers to investigate mechanisms of allergic responses in addition to only IgE-mediated disease. In conclusion, while the method of sensitization used is at the discretion of the investigator, the local anaphylaxis assay is versatile and can be used with a variety of sensitization methodologies. Ear swelling, a commonly used marker for assessing allergic responses, can also be measured after OVA challenge. We have found that ears challenged with OVA have significantly more swelling than ears challenged with PBS at 1 hr post injection. In contrast to the Evans Blue test, we have observed that ear thickness measurements are less sensitive than dye extravasation and exhibit greater variability between investigators as ear thickness can be altered by compression of the ear when using measuring devices. Mouse strains other than BALB/c may be used for the local anaphylaxis assay; however absorbance readings will vary slightly depending on the strain used. Because of their propensity to develop strong Th2 responses, BALB/c mice generally produce reliable, reproducible readings with this assay. This assay allows for the quantification of localized allergic responses in animals sensitized to a variety of antigens. Antigen selection is flexible, as the assay has been successfully performed with common allergens, such as OVA and Keyhole Limpet Hemocyanin (KLH). Furthermore, in lieu of sensitization, a local allergic reaction can be elicited in a naïve animal by injecting antibodies that cross-link IgE or IgE receptors on basophils and mast cells, or by ligating non-IgE activation receptors on these cells such as CD200R31. The authors would like to acknowledge Dr. Ellen M. Fox for her work regarding this model of local anaphylaxis. This work was supported by the Uniformed Services University of the Health Sciences grant number R073UE. Kojima, T., et al. Mast cells and Bbasophils are selectively activated in vitro and in vivo through CD200R3 in an IgE-independent manner. The Journal of Immunology. 179, (10), 7093-7100 (2007). Parikh, S. A., Cho, S. H., Oh, C. K. Preformed enzymes in mast cell granules and their potential role in allergic rhinitis. Current Allergy and Asthma Reports. 3, (3), 266-272 (2003). Amin, K. The role of mast cells in allergic inflammation. Respiratory Medicine. 106, (1), 9-14 (2012). Nakaya, M., Takeuchi, N., Kondo, K. Immunohistochemical localization of histamine receptor subtypes in human inferior turbinates. Annals of Otology, Rhinology & Laryngology. 113, (7), 552-557 (2004). Ramsdell, S. G. The use of Trypan Blue to demonstrate the immediate skin reaction in rabbits and guinea pigs. The Journal of Immunology. 15, (4), 305-311 (1928). Chase, M. W. Studies on the sensitization of animals with simple chemical compounds: X. Antibodies inducing immediate-type skin reactions. The Journal of Experimental Medicine. 86, (6), 489-514 (1947). Goose, J., Blair, A. M. J. N. Passive cutaneous anaphylaxis in the rat, induced with two homologous reagin-like antibodies and its specific inhibition with disodium cromoglycate. Immunology. 16, 749-760 (1969). Ovary, Z. Passive cutaneous anaphylaxis in the mouse. The Journal of Immunology. 81, (4), 355-357 (1958). Ovary, Z. Immediate reactions in the skin of experimental animals provoked by antibody-antigen interactoin. Progress in Allergy. 5, 459-508 (1958). Akiyama, H., et al. Quantitiative evaluation of passive cutaneous anaphylaxis (PCA) using a hand-held spectrophotometer. Biological & Pharmaceutical Bulletin. 19, (8), 1112-1114 (1996). Teshima, R., et al. Simple spectrophotometric analysis of passive and active ear cutaneous anaphylaxis in the mouse. Toxicology Letters. 95, (2), 109-115 (1998).